In the French capsule, the available notarial act is published in its entirety. In the English capsule, we only publish the summary. for the other half, heir to her deceased brother Jean-Baptiste Matte He died about 43 years ago, for lot 240.
southwest by a private road. Date: Filed on June 11, 1883. Seller: Hypolite Denis, farmer from Pointes – aux- Trembles (Neuville),. The lot 311 lot was bought by Joseph Dubuc through notary Robin in 1777, and then transferred to Joseph Dubuc his son, who transferred it to Germain Dubuc his son in 1835 and then to Joseph his son in 1862. He it is who is refered to in this sale. Seller: Joseph Dubuc, farmer has the Pointes- aux-Trembles (Neuville). In 1908, the Committee of old families honored 273 Quebec families. For the commemoration of the 300th of the Foundation of Québec, the Committee undeer the leadership of Mr. Edmond Valin of St - Augustin de Desmaures had the idea of celebrating of the families still faithful to the homeland. Families that since 1708, maintained in their possession their ancestral land. This celebration would be the bright closing of the celebrations of the tricetenairy of the founding of Québec. On September 23, 1908 at Laval University the highest dignitaries were pleased to attach the cross of honour on the chest of the noble descendants of the first settlers in the St. Lawrence Valley. This cross of honour was composed and designed by M. E. task, Deputy Minister of lands and forests, Quebec; performed by Mr. Abel Lafleur, engraver, Paris. The metal is silver gilded, being variously nuanced Maple leaves. The coat of arms of the Center is light green. 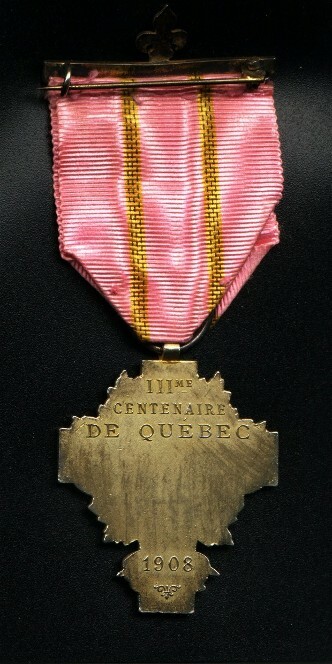 The reverse is plan, and bears the following inscriptions: III * Centenaire de Québec - 1908, and, in addition, the name of the family who was awarded the decoration. The Ribbon, which has been the subject of a special manufacture in Saint - Étienne, France, is pink, striped moire silk in its length of two lines wide, Golden. 1 - Nicolas, Saint-Cyr, Bishopric of Rouen, married in 1671, to Madeleine Auvray. 2 - Nicolas, married in 1705, to Marie - Angélique Cocquin. 4. - Augustin married in 1772, Marie - Scholastique Vézina, in 1801, to Judith Bertrand. 5 - Paul married in 1808, to Madeleine Faucher. 6 - Paul married in 1844, to Marie - Archangel Létourneau. 7 - Augustin married in 1893 to Elise Gosselin. 1. -Nicolas, Saint-Cyr, Bishop of Rouen, married in 1671, to Madeleine Auvray. 3 - Nicolas, married in 1739, to Marie Godin. 4. -Nicolas, married in 1771, Marie-Geneviève Faucher. 5 - Nicolas, married in 1799 Angélique Mercure. 6 - Nicolas, married in 1833, Nathalie Létourneau. 7 - Joseph, in 1860, to Virginia Delisle, in 1877 to Phébée Langlois, 3 ° 1887, Philomène Delisle. Buyer: Joseph Doré(frère de Raoul), farmer in the Pointes - aux Trembles (Neuville). Load: Pay the entire discharge all debts, take care of his sisters in the common home helping their brother to the extent possible. Note: Charges for the sisters struck March 30, 1937. Costs of repair or new construction made to common costs by the appearing persons or their representatives. Miscellaneous: Sugar shack with its tools, a farm, animals and tools, crops, a half-share in a threshing machine, and a table saw with Mr. Georges Julien, hay New Holland press. Right in the hatchery of St-Augustin, Quebec Growers Union, Society of Aqueduct. Price: $24,000.00 (already paid $ 10,500.00 on January 15, following $500 balance in 22 annual installments of $800 is $ 400 May 1st and $400 on November 1st (3% interest rate). for reimbursement of $ 10,650.00 him remaining still due. Lot # 332: second row of the parish of Pointes-aux-Trembles, sixty acres of area. Miscellaneous: Sugar schack and tools to run the farm, animals and tools, crops, a half share in a threshing machine, and a table saw with Mr. Georges Julien, hay New Holland press. (paid 10,000.00 cash, November 25 following 3,000.00 $(acquitté le 21/3/1960, interest rate 3%). The balance to Mr. Joseph Doré (of Quebec) in 19 annual instalments of $800.00. Payable in 2 payments of $400.00 in May and $400.00 in November. First payment may 1, 1959, at a 3% interest rate. The mortgage was struck by release on November 12, 1961.
repayment of $ 10,650.00 still due. Buyer: Pierre Warren, Engineering Council, 600 Grande Allée Est Québec. threshing machine, and a table saw with Mr. Georges Julien, hay New Holland press. Price: $29,000.00 ($ 15,101.32 cash balance $13,898.68 will pay to the office of credit Agricole of Quebec under a deed of loan to Marie-Anna Bennett.) Balance paid on February 5, 1965. Highway 138 by the width of the original batch. the width of the original batch. Seller: André Simard, operator, born in Chicoutimi (14/03/1946) remaining 1348 rte 38 Neuville, Quebec, G0A 2R0 and Madeleine Savard, Secretary-Receptionist, born in Chicoutimi (27/04/1947) residing at 1535 St - Paul, l'ancienne-Lorette, G2E 2 A 3. Southwest bet lot 241, (116.95m wide by 525m long). (C) part not subdivided, northwestern part by lot 562, northeast lot 236, southeast lot 240, south-eastwest part lot 241, (43.85 m wide by 58 m long part of lot 562, former passage of the Canadian Northern Quebec Railway passed through of the lot described in B, (30.48 m wide by 58 m long). A) part bounded: Northwest Highway 40, North lot 238 & 239, Southeast lot 240-1 & 240-2 and Highway 138, Southwest lot 240-2, part of lot 241. From Highway 40 to Highway 138 by the original 240-1 and 240-2 width. B) part bounded: Northwest Highway 138, Northeast lot 237 & part lot 236, southeastern part of lot 236 & lot 562 (belonging to André Simard and Madeleine Savard or representatives), Southwestern bet of lot 241, 2 acres of wide in its regular part. C) part bounded: Northwest by lot 562, Northeast lot 236, southeastern St. Lawrence, southwestern part of lot 241, 1 arpent northwesterly, contained between the former crossing railway line and the St-Lawrence River. Transfer: $1,258.00 town of Neuville.